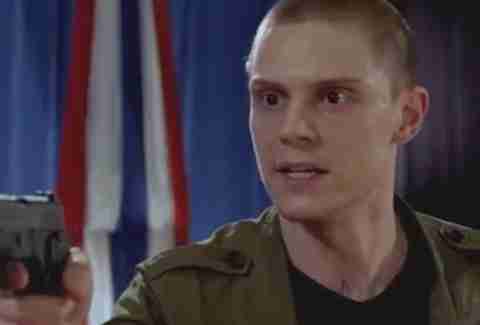 In the season finale of American Horror Story: Cult, “Great Again,” our villain Kai Anderson (Evan Peters) delivers a monologue that sums up the theme of the season: the dangerous power of male humiliation. 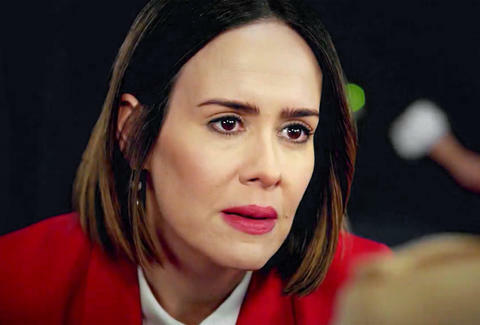 In trying to intimidate our pseudo-protagonist Ally Mayfair-Richards (Sarah Paulson), who’s running for senate, he rushes the stage with a gun and taunts her with the notion that she’s nothing more than an empty symbol of female resistance, and that her platform will be dismantled once he kills her. It’s a powerful moment punctuated with a topicality that’s been the life blood of Cult, a season explicitly borne of President Trump's election and the chaos his win provoked. In the wake of the shootings in Las Vegas and Sutherland Springs, and the sweeping allegations of sexual misconduct in Hollywood, plus accusations that prospective Alabama senator Roy Moore assaulted underage girls, the news cycle is especially rife with examples of toxic masculinity. But it’s no accident that Cult’s finale hits such a societal nerve; it’s completely by design, and possibly to its detriment. Ratings for Cult were down from previous seasons, and in general the conversation seemed to swing away from a show that once dominated Twitter trends. Reviews were also mixed; The Wrap declared it the show’s “best season since Murder House,” while IndieWire dubbed it an “apolitical snoozefest.” That’s par for the course when it comes to American Horror Story, a series that delights in its divisiveness, but it’s curious why a season designed for peak controversy barely struck a chord. That’s probably attributable to just how close Cult echoed the real world. Previous seasons were whacky to the point of dissociation (think: antichrists, aliens, minotaur ghosts, demonic butchers), but Cult’s would-be trending words could come from any run-of-the-mill 2017 news story. It tackled everything from mass shootings to Mexican immigration to white feminism, topics that, given their proximity to reality, offered little room for commentary or analysis. 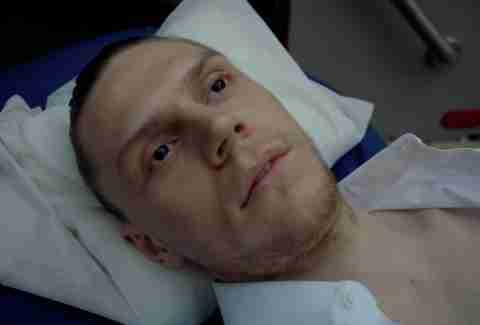 How does an audience reconcile itself with fictitious events that play like everyday concerns? Here's something you don't hear too often: More clowns, please! Yes, the first thing we knew about Cult is that it would focus on the election, but we also saw the season kick off with those horrific killer clowns. They were the basis of every trailer and poster, took up the bulk of the opening credits, and were the big talking point going in. While the early episodes deliver on making the clowns a menacing force, they quickly lose their steam once their hidden identities are revealed, and by mid-season, they were almost entirely absent from the narrative. While this actually works in the context of the show -- peeling back the layers to show that the villains underneath are far scarier than their masks -- it’s a critical flaw when it comes to audience engagement. Unmasking the villain deflates the balloon, and in this instance, allowed for the show to once again rely on political turmoil for shocks instead of more traditional horror. Again, from a critical perspective, this isn’t a detriment. Kai’s ascension to terrifying cult leader was an organic power play that piggybacked off the initial chaos the clowns wreaked on their community’s psyche. Still, without the season’s most iconographic element, it’s easy to see why interest tapered off. By aligning its characters with real-world political candidates, Cult never quite established a “good guy,” and that made it hard to root for anyone. Kai’s obsession with Trump was obviously played to its most villainous extreme, but early on, the show also poked fun at Ally’s backhanded vote for Jill Stein. Her anti-Hillary vote is what turned her wife Ivy against her, but then Ivy joined Kai’s cult and started murdering people. This means that every potential hero character had blood on their hands by the end, which prevents clear stakes from being established. Are we supposed to be mad that Ally voted for Stein? Are we supposed to hate Hillary voters for weakly giving in to Trump? There’s no indication of a creative motive, and the lines are especially blurred once Ally kills Ivy and becomes something of a wildcard. It’s played for maximum impact, but it doesn’t make a lot of sense from a political perspective. Why did the Stein-voting Ally borrow the most empowering and memorable lingo from Hillary’s campaign? We don’t know if she regrets her vote, and there’s no follow-up that insinuates she’s changed her modus operandi offscreen. In fact, by episode’s end, when Ally pulls up her velvet green hood, we can assume she’s started her own cult built on the pillars of female rage. It’s a chilling notion, and a confusing one; it sends the message that in toppling the patriarchy, women establish their own toxic breed of power -- which seems antithetical to much of what came before, and confuses any feminist yarn the season might have been spinning. Even with those complaints lodged, I remain firm in my belief that Cult is one of American Horror Story’s best efforts -- just a poorly timed one. The surreality of post-Trump America is well-portrayed in these 11 episodes: nothing makes sense, no one’s a hero, and answers are ill-defined and untouchable. It may not work right now, but with distance and perspective, we may come to see Cult as a Kodak moment in the American hellscape.